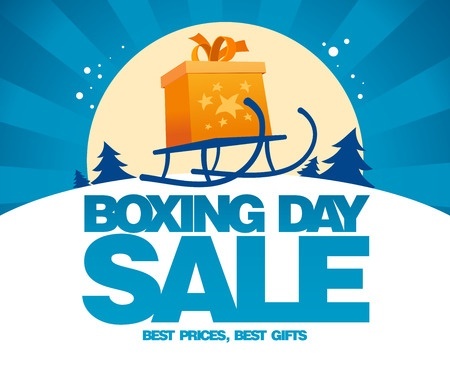 Being an avid bargain hunter the very best shopping day of the year is Boxing Day, when the after Christmas sales begin and there are bargains galore to be had for the taking - or rather the buying. Getting up early, eating a good breakfast, dressing in comfy clothes and shoes and packing bottles of chilled water and packets of munchies just adds to the excitement of the day. Checking my purse to make sure I have my Christmas money safely tucked inside is the last thing I do before I head out the door, ready to go straight to my shopping centre of choice (it varies from year to year, depending on what bargains I'm after) nice and early. I like to get an undercover car park if I can during summer and on the day the Boxing Day sales start I need to be early - really, really early. It's all part of the fun of the bargain hunting. Hours have been spent poring over the junk mail and listening to the ads on TV, store websites have been thoroughly scanned for specials and bonuses. Lists have been made - things for the house, things for the children, gifts to be bought for during the year, even next year's Christmas gift list has been started. Having a plan of attack (it really is like a bunfight sometimes) will help you get through the day in one piece and still sane. Use a list to know where you have to be first, you'll want to get the most important things one your list first so you don't miss out, then work through the other items you want to buy. If something is really important to you then don't hesitate, buy it straight away. Yes, it may be further reduced a few days later but you also run the risk of missing out. Can you live with that? Or would you rather buy it at the originally reduced price and run the risk of it being reduced again later on? The after Christmas sales are the perfect time to buy Christmas specific things. Wrapping paper, ribbons, cards, fabrics, decorations, even food will be greatly reduced and could be worth buying. Remember, if you already have enough wrapping paper covered in reindeer and Santa and boxes of Christmas cards to last you the next 10 years I'd say you probably don't need any more. But if the wrapping paper comes in plain colours or less specific patterns it can be used for birthdays, weddings, new babies etc. and buying it cheaply will save you money. It's also a fantastic time to add to your collection of decorations, with items being up to 75% off the original retail price. Lights, lawn decorations, tinsels, wreaths, tree ornaments and craft items can be bought now and stored with your current decorations ready for next Christmas. One mum I know buys each of her children a new tree ornament each year during the sales. She is putting them into a box, labelled with each of their names, so that when they leave home they'll have a set of decorations for their Christmas tree. I think this is a lovely idea and picking up the ornaments during the sales she is getting much nicer items at rock bottom prices. Thinking outside the square can save you big bucks. Fairy lights can be used not just for Christmas but for birthdays, to light outdoor patios, to turn a little girl's bedroom into a fairy grotto, just use your imagination. After Christmas they can be reduced by up to 80%, a great saving. The after Christmas sales can also impact your grocery budget. You'll find turkeys, hams, duck and chicken all reduced after Christmas. Chocolates, puddings, custards and lollies will be reduced as well and they can all be put away for birthdays, Easter and other celebrations through the year. Just check the best before and use by dates so they'll be in peak condition when you go to use them. Hampers and gift packs are big business at Christmas time and after Christmas they are reduced by anything up to 90%, depending on what they are. I buy hampers, especially toiletries and cosmetics and break them up to use as teacher gifts and small thank-you gifts throughout the year. It would be easy to go crazy during the after Christmas sales and buy everything that catches your eye. Be strong, don't go crazy and buy because it's there. Shop with a plan and a purpose and you'll be a happy shopper at the end of the day.